This is the second half of last week's holiday show. While Christmas has come and gone, we all would like to extend the spirit of the holidays. So this show begins with three tracks from Truth Revolution Records holiday album "Together". That is followed by some memorable jazz releases of 2014 from Jimmy Greene, Tom Guarna and Kavita Shah. Here is a podcast to make your holiday celebration a jazzy one. From Christmas classics, to modern jazz tunes, this show will put you in the holiday spirit. Wishing you all a peaceful, joyous holiday season. On this 50th Anniversary of the recording of John Coltrane's classic "A Love Supreme", we feature this landmark suite in its entirety. For this podcast each movement is performed by a different artist. We start with Trane, then Branford Marsalis, Jazz at Lincoln Orchestra and finally, the Turtle Island String Quartet. Before that tribute set we review some of the great recordings released this year from the Cookers, Fred Hirsch, Noah Baerman, and Jimmy Greene. 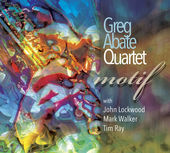 This podcast features multi reed player Greg Abate and his new album Motif. Greg phones into the show for a brief interview about his latest CD, traveling and upcoming gigs. Lot's of other great music here from Jonathan Blake, Monk, and others. We also feature a groovin' band with some Hartford roots in with Vin Scialla and Eric Schugren. We end this show with a Christmas teaser from Dane Scazzari. BIBIMBOP ~ Vin Scialla, Eric Schugren & Brian Charette ~ WAKE UP!